Are you aiming to set up an ecommerce store with WordPress? If yes, then I am sure that at some point you will need an effective payment gateway that makes all your payment transactions as easy as flipping a switch and watching the money flow in. And since we are living in a complete credit-based economy, I feel it is very important to come up with something that enables customers to check-out and pay for their purchases easily and most important, securely. Did you know? The roots of what we today know as payment gateways stretches far back to the days 1998 with the launch of PayPal. After a couple of years when eCommerce continued to make its meteoric rise, the several payment gateway technologies began to pop up proportionately. Whether it’s for WordPress or WooCommerce, such technologies have evolved and diversified to suit their needs. Now before deciding upon any option in particular, here’s a thing that I would like to reveal about payment gateways; you may not be responsible for designing them or developing the code that processes payments in the first place but that clearly doesn’t mean that you can wipe hands off what happens once your visitors land on them. In a layman’s language, if you are including a payment gateway on your site then it’s a part of your visitor’s experience and needs to be accounted for you as it shapes that experience for them. Let us understand the term payment gateway! It is basically a third party tool that evaluates and processes payments from your end customers. Which means that instead of setting up a basic contact form that requires customers to fill in their information to place an order which you have to process from your end- No need for such hassle! The payment gateway handles it all from your behalf! Cost- Almost all third-party integrations have an upfront cost associated with it. And with such technology one even needs to take a closer look at the fine print as there are fees you’ll need to pay for each transaction processed. Payment location- There are a few technologies that enable users to add the payment gateway on the direct basis to the site with the help of API. Which actually is a good thing as it prevents the feeling of being disrupted. Now think of PayPal or Authorize.net or Amazon Payments, all of them are one of the well-known and trusted payment gateway providers used by most of the WordPress development companies across the globe. But the question is which is best for a WordPress site? I am sure that most of you must be having a PayPal account. And maybe that’s the reason why PayPal Payments Standard is one of the most popular payment gateways of all. It may quite interest you to know that PayPal is one of the easiest payment gateways to configure. Regular users will easily come to know if they are redirected to the Paypal website. In addition to this, there are no processing, authorization, and security issues for you to worry about at your end – simply add a Pay with PayPal button on your website, and let PayPal handle the rest. Customers can pay with any major credit card or their PayPal account. Next we have in line is Stripe. One of main advantages of using this method is that it offers on-site payments without any monthly fee. Being a slightly trickier proposition to configure, it is considered as one of the best payment gateways for the job. In case of any dubious transactions, Stripe incorporates an effective anti-fraud team on-hand. Apart from this, it supports recurring payments out-the-box and is one of the best solutions for international businesses. Another well-known and trusted payment gateway that turns out to be a high-quality technology by allowing you to accept all major credit cards directly from your website. If you are considering a classic gateway functionality then Authorize.Net is similar to PayPal’s traditional gateway options where each is the middleman between your site’s checkout and your payment processor. But there’s one major difference — ease of getting started. Last but certainly not the least is Amazon payments, it is one of the best ways to boost conversions. The process includes that after logging into their Amazon account, the customer’s Amazon details – including address and payment information – will be passed through to your website for a quick checkout. This simplifies the checkout process from a customer’s perspective, and the Amazon name gives them peace of mind. This technology offers a golden opportunity to make all their online payments using one account. 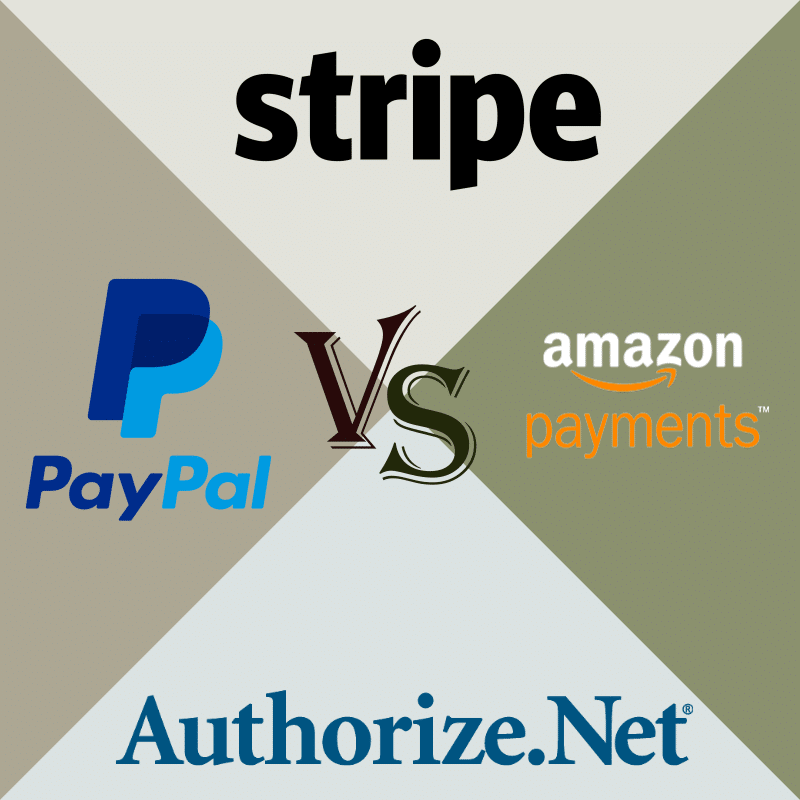 So, which payment gateway to choose? Of course, the answer is subjective. Most of the time, I recommend combining our on-site gateway with at least one of the other two options, PayPal Standard vs Amazon Payments so that you are likely to get more conversions. I hope you find this post helpful. Keep watching the space to know more!